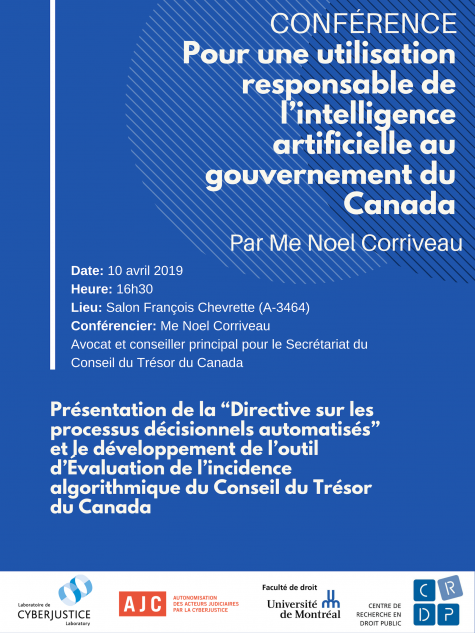 On Wednesday, April 10, 2019, will take place a conference presented by Me Noel Corriveau, lawyer and Senior Advisor for the Canadian Government. The objective of this event will be the presentation of both the Directive on Automated Decision-Making, concerning the use of artificial intelligence (AI) in the administrative decisions process, and the Algorithmic Impact Assessment (AIA), which is a questionnaire allowing the evaluation of risks linked to the use of algorithms within decision systems. Canada is actually the first country to provide itself with such a tool. The constant evolution of technologies forces a continuous effort; therefore, it is with collaboration, openness, and transparency in mind that the conference occurs. Me Noel Corriveau is a lawyer and Senior Adviser for the Treasury Board of Canada Secretariat. He is working as part of the Office of the Chief Technology Officer (CTO), working on files regarding cybersecurity, digital enablement, and information technology (IT) innovations within the public sector. He is also coauthor of the AIA.